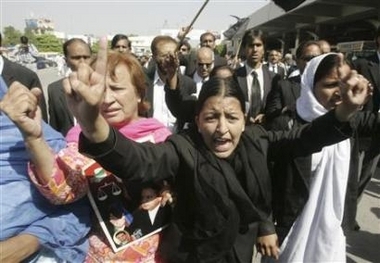 Condemnation: Who is Going to Judge the Judges? “For God sent not his Son into the world to condemn the world; but that the world through him might be saved.” (John 3:17 KJV) Institutionalized Christianity has a long history of condemnation, from the Crusades to the Inquisition, and from the Church Lady to Westboro Baptist. The only sin you should ever get concerned about is your OWN. If you are sitting there reading this thinking, “Yeah, but, what about that group?” or, “What about those other guys?”, then you have the wrong perspective about sin. The Bible teaches clearly that a Holy God cannot/will not tolerate sin, and that sin will be judged. Since sin and death cannot abide in the presence of the Living God, unresolved sin will be left to its own devices. In essence, it will judge itself, and those who reject God’s provision for payment will bring death and separation from God upon themselves. Sin by its very nature requires condemnation because it brings death. Apparently Christ does not condemn, he only saves. Repeat that. Remember that. In a world full of blame, finger-pointing, criticism, and condemnation, Christ does not condemn. I bet most of us still focus on the theology of right and wrong, and we focus on God as the Righteous judge. Curious, then, that His only son didn’t come as a judge but as a Savior. Read John 8 sometime. When the Pharisees accused Jesus of being a demon possessed Samaritan (racial slur) he said, “I am not seeking glory for myself; but there is one who seeks it, and he is the judge. Very truly I tell you, whoever obeys my word will never see death.” (John 8:50-51) God didn’t send his Son to condemn, but to give life. As John said, “For God sent not His Son into the world to condemn the world, but that the world through him might be saved.” If you were ever a sinner, if you have ever wronged someone else, or if you have ever been less than godly: remember that, and be grateful; remember that, and be gracious. Who is going to heal the scars, and who will judge the judges? But in the end, your condemnation will not help you win. Three fingers there upon your hand are pointed back at you! He came, not to condemn the world, but that it might be saved. And offer love instead, because you know love always wins. “And Jesus lifted up himself, and said unto her, Woman, where are they? Did no man condemn thee? And she said, No man, Lord. 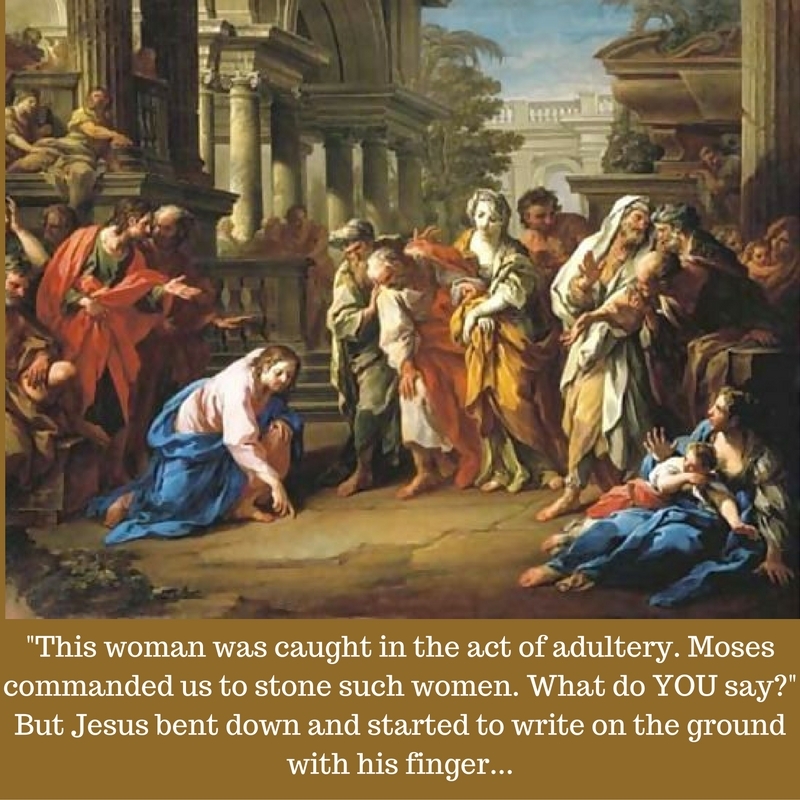 And Jesus said, “Neither do I condemn thee: go thy way; from henceforth sin no more.” (John 8:10-11 ASV) The woman caught in adultery is one of the more dramatic scenes in the Bible, and has a number of interesting elements to it. First of all, there’s a note in most Bibles that says 7:53-8:11 were not included in the earliest manuscripts of John’s Gospel. Scholars feel that it was probably inserted after the original version was written, because Jesus was not at the meeting of the Pharisees, and the transition “Then each man went to his own home. But Jesus went to the Mount of Olives” seems a little abrupt. They also place it logically after Luke 21:37-8, which states that Jesus stayed on the Mount of Olives and came early each day to teach in the temple. In any case, the story was included because it was undoubtedly true to circumstances and to Jesus’ teaching and character. The Pharisees were trying to place Jesus onto the horns of a dilemma, asking him to render judgment that would be wrong no matter what he chose. In the first place, it wasn’t a fair trial, and it didn’t follow the law. Deuteronomy 22:22 said, “If a man is caught sleeping with another man’s wife, both the man who slept with her and the woman must die.” The Pharisees didn’t bring the man involved, only the woman. If Jesus permitted them to stone the woman, he would have broken the law. He would also have offended the Romans because under Roman law the Jews did not have the right to exercise capital punishment. Some speculate that perhaps he wrote the names of some of the men themselves, surprising them and convicting them as they looked on, wondering how Jesus knew so much. Whatever he wrote there in the dust, it must have provided dramatic counterpoint to the motives and intents of the self-righteous hypocrites. The accusers stood there, stones in hand, ready to execute judgment and condemnation. Somehow, with a few words written in the dust, Jesus stopped them in their tracks. We don’t know exactly what he wrote, but it was effective. This story provides another instance of Jesus declining the chance to condemn, although the language is interesting, because he asks, “Did no man condemn you?” And she answers, “No man, Lord.” The subtlety of his inference is both loving and direct, because he does not exclude the real possibility that God would not approve of her activity…and his actions challenged her to reconsider everything she thought about God, accountability and judgment. He encouraged the woman to change her ways and leave her life of sin, but he did not exercise judgment. Christians (followers of Jesus), take note! Imitate. I have always wondered what became of this woman, and how she lived from then on. The power and magnitude of Grace calls us to leave our sinful lives and remember what Jesus did. He didn’t come to condemn, but to save. He doesn’t lower the bar, or make excuses, or spin that it’s ok to sin. He gently but powerfully reminds us that we are called, not to make anyone ELSE holy, but to BE holy. Probably such a full time job that we’ve very little time left over to accuse anyone else. Because a man had tried to own her. And let her know that she was not alone. But Jesus looked at her; He didn’t budge.